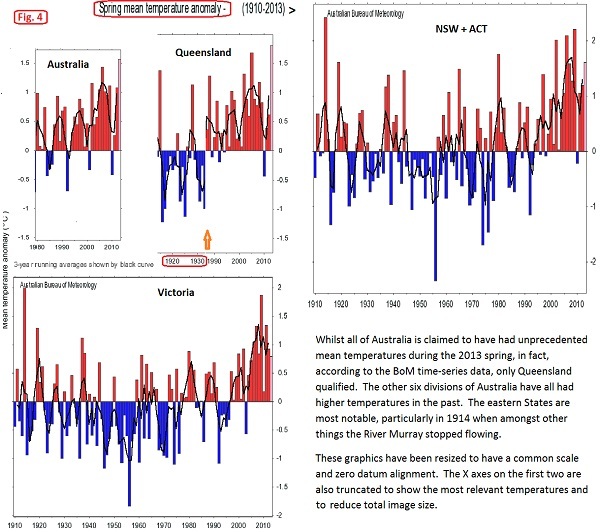 Bob Fernley Jones takes a close look at Australian temperature records, and finds that while the BoM can fish out records that are technically true, those “records” can also be paradoxically irrelevant and largely meaningless at the same time. Not so long back weren’t these same people telling us that only long term climate trends mattered, and that one hot or cold year, or bad storm was cherry picking and unscientific? Dare I suggest the obsession with headline records is more a PR stunt than a scientific measure? January 2013 was not the absolute hottest January in any state or territory. Spring 2013 – not the hottest spring anywhere except in Queensland. South Australia had the hottest ever year, but none of its seasons was a hottest ever season. In the end, Australian temperature records are only 100 years old (according to the BoM anyway). Parts of Australia are 4,000 million years old. Wouldn’t impartial scientific advisors also point out the bigger perspective on how scientifically meaningless these records are? More Naughties From The Australian Bureau of Meteorology et al. Now that temperature data for last summer (Dec – Feb) are out, let’s review some scary authoritative pronouncements from the past year. Summer in this hot dry land [C] is arguably more important than whole year average temperatures, so let’s firstly take a closer look at the BoM data for summer. Fig. 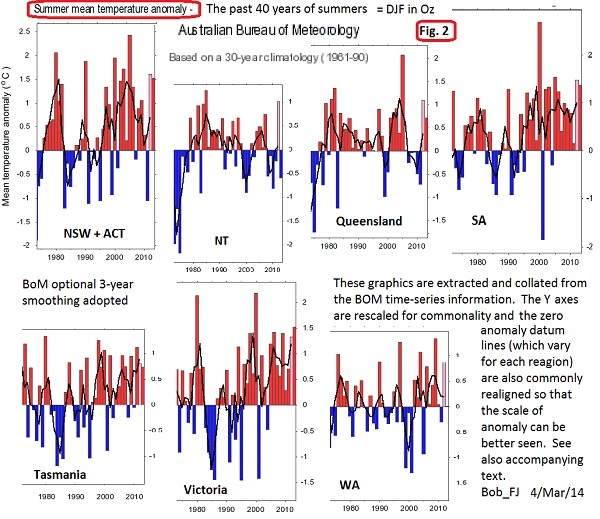 1 below comes from two BoM time-series graphics for all of Australia, that include the latest 2013/4 summer data. The pink bars highlight the 2012/3 “angry summer”, and notice that the surrounding six or more years are much cooler (including unannounced below “average” blue) in both cases. Words like “excessive noise”, “outlier” and “significance” could be used. I’ve added green horizontal lines showing two alternative comparative averages over the last seven and twelve-years, (based on the so-called raw data in both cases). Those high peaks may be mere noisy outliers. Nevertheless, the so-called “Climate Council” [D] which was reincarnated from the sacked tax payer funded “Climate Commission” has issued another report calling the 2014 summer as another angry summer with even more records broken than 2013. Strangely, global average temperatures (which include Australia?) from various other authorities start from 1850 or 1880, not 1910 (when BoM records start). Furthermore, the period 1850 -1910, according to some sources, included extremely hot times in Australia (like in 1896); since discarded by the BoM. According to the Fig. 1 data, the 2012/3 summer for the whole of Oz was prima facie unprecedentedly warm. However, there is a paradox to be found in the more detailed BoM data following next. In short, ALL seven divisions of Australia have records of significantly warmer summers in past years. It is possible that when each state had its “hottest” ever year, the other states had cooler years so the net total average across the nation was smaller in those years. But nonetheless the claim that it was therefore an unprecedentedly hot 2012/3 summer is a potentially misleading claim. Most people in all the states of Australia have lived through hotter summers, and one hot summer in one part of the world doesn’t tell us anything about cause and effect and CO2. And, what of Dr Jones’ claim for January 2013? Fig. 3 below gives relevant BoM data for January in all seven divisions of the country, and from those data, again, it is misleading to imply that January 2013 was unprecedentedly hot. Incidentally, if you prefer to look at only maximum temperatures in January or whatever, a starting link is here. Then use the drop-down menu. The outcome you would find is somewhat similar. “We know last year for example, every single case that we’ve recorded temperatures was above average. We know every place across Australia is getting hotter, and very similarly almost every place on this planet”. But, the BOM records show that only South Australia was significantly warmer in 2013. It may be that this ambiguity of data arises from the major “noise” alluded above being in random annual and regional distribution? Thus, usually whilst there may be a big high in one region at a particular time, in others it is generally simultaneously low, such that their average is depressed. 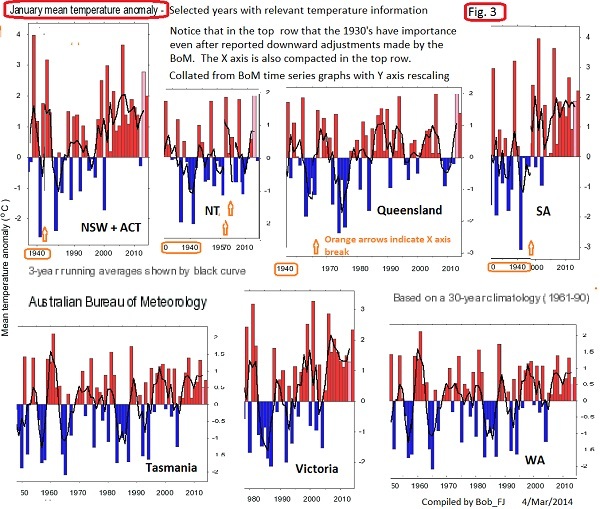 Study of the time-series in Fig 5 reveals that the significant high in South Australia atypically coincided with modest highs in all the other six regions in 2013 such that their combined average was a high number without any significance trend-wise. A disturbing aspect of this is that statistical matters are a part of the work requirements of the BoM and yet a relevant senior representative (Dr Jones) does not point out how relatively insignificant many of these “records” are. Strangely, although the record for the whole year was hotter, all of its four seasons were simultaneously cooler. Anyway, since the BoM 30-year average for winter varies from 19.00 C for Northern Territory to 6.40 C for Tasmania it would seem to be good news if it were warmer in winter? Incidentally, NT has a noisy but strong cooling trend in winter since 1995. [A] In September 2013 one of the first things done by the new Liberal-National Party government, was to dismiss the Climate Commission headed by Prof Tim Flannery. They reincarnated themselves with crowd-funding allegedly to a million dollars. A sympathetic Wikipedia article is here. [B] Dr David Jones is Head of Climate Analysis, National Climate Centre, BoM. [C] There is an iconic poem by Dorothea Mackellar first published in England in 1908 when she was feeling homesick about her sunburnt Australia, (despite the cattle dying etcetera). Australian version of 1911 is here. [D] The Climate Council report does not stack-up with Fig. 2 above and this article entitled “Lies of the Climate Commission/Council: Part 18” is somewhat indicative of its reliability. If I had faith in our thermometer records, I might agree with you. But as it is, I can only wonder if it is true. ‘If I had faith in our thermometer records’, but you doubters also have little faith in proxies! Just look at what derision the hockey stick attracts? Even although it has been confirmed to be a true and accurate representation by several different scientific investigations and methods, such as ice cores, sediments, etc, etc. So doubters can’t have it ever which way as long as they agree with the results! As usual BA you’ve arrived in the nick of time to say something irrelevant. Bravo. The hockeystick is utterly useless here because it doesn’t do proxies after 1980. I wish it did (It’s only a hockeystick because they use the temperature records, and NOT the proxies eh?). I’d love to see and unbroken single proxy that continued from 1200AD to now. But strangely (I wonder why?) no one seems keen to update the tree ring records from 1980 onwards. Looks like scientists cant find any trees that have grown over the last 30 years… or could it be the line just doesn’t do what they wanted it to do? It was only a few days ago that you invited the “Warmists back to your blog. Actually I think BA4 has said something relevant. ‘If I had faith in our thermometer records’, but you doubters also have little faith in proxies! Of course we don’t have any Faith in Proxies. We are doubters. Especially not in Proxies, which are reconstructed records. The Hockey Stick is rejected because Michael Mann fudged his record and appended the temperature record to a tree ring record without making it clear that that is what he had done. Jo, I know you said that already but I wanted to add my interpretation. blackadderthe4th. What is your response? Didn’t Mann find that when they looked at the tree ring proxies after 1960 the temps went down (he called this reduction of temps, ‘divergence’). So Mann had to replace the tree-ring proxies with the temp records to show the ‘hockey stick’ effect. McIntyre and McKitrick discovered this when they finally got hold of Mann’s data which he tried to hide for some time. Briffa was advised to use the same ‘trick’ (i.e. to ‘hide the decline’) after his work on trees at Yamal. Regarding the medieval warming period: here’s a very nice bit of real world evidence for what was happening which seems to have been forgotten in ‘climate change’ discussions. It’s all on the internet. I just got an idea on climate models. Climate is a chaotic dynamic system with a lot of known and unknown factors that affect the outcome. Technically it should be very much easier to pick the numbers for the next national lottery/Lotto than forecast the global/regional climate/weather in year 2100? They can’t and thereby showing that it’s just political fairytale. How can it be that political based fairytale models of future climate have such an impact on national and international policy? And when everything weather wise is a sign of CAGW it’s like betting on all the numbers on the coupon in National Lottary/Lotto? Actually Jo, I recently saw a 5-minute Youtube video in which Professor Richard A Muller does update the Phil Jones 1999 graphic (not the ‘hockeystick’, I know). He removes the temperature data (“Mike’s trick” to “hide the decline”) and displays the graphic having reinserted the leaked/hacked proxy data for 1961 onward – all three datasets then go down – one quite dramatically so. So you call yourself blackadderthe4th. I have problems with that straight away. The character from Blackadder goes forth was always questioning authority and used humor to point out their hubris. You seem to support all authoritative bodies and appear incapable of the slightest hint of lightheartedness. You go on to claim that doubters have little faith in proxies. If you bothered to read Jo’s posts before commenting you would find them riddled with proxies. Now to my main point, how much weight do proxies carry? Ice core vs Ice core. Sediment vs sediment etc. Are these local or global? From all your comments it appears that if they are close to your opinion they are global and true. Other proxies that you do not like are either local or debunked. Seeing as if you are here to set us “doubters” straight why not use some wit by changing your name to baldrick and compile a proxy on turnip growth. Just in case you did not notice, even the CRU decided to very quietly throw the Hockey Stick under the bus late last year, using Briffa’s own figures! The rest of us had recognised it for the BS it was a long time ago. Many thanks to Steve, Jo and Anthony for exposing this all too typical piece of ‘climate science’ for exactly what it was. Doubting = questioning, I find this an essential survival trait especially when defending against self serving regimes that wants to take control of such things as our; money, lifestyle, freedoms, choice, employment, independence… hairstyles. Say BAD, what sort of hair cut do you have? Since the by far the greater number of proxy records that cover the appropriate time period, show distinct medieval Roman and Minoan warm periods, as warm or generally warmer than the modern warm period and they were made to vanish in the hockey stick,I have to give you an F for this post BA. Perhaps a bit more BS from BA. A proxy is used to infer the value of a variable. It doesn’t measure the variable. We know that mercury in a tube will expand and can be used to find the temperature when calibrated. When ever a measurement is described as a proxy, there is no known way to convert to an actual measurement of temperature. There is a rough idea that the proxy is temperature dependent and that is all eg. a tree will grow better if the temperature is around 28°C and growth will stall if it gets into the low to mid 30s. 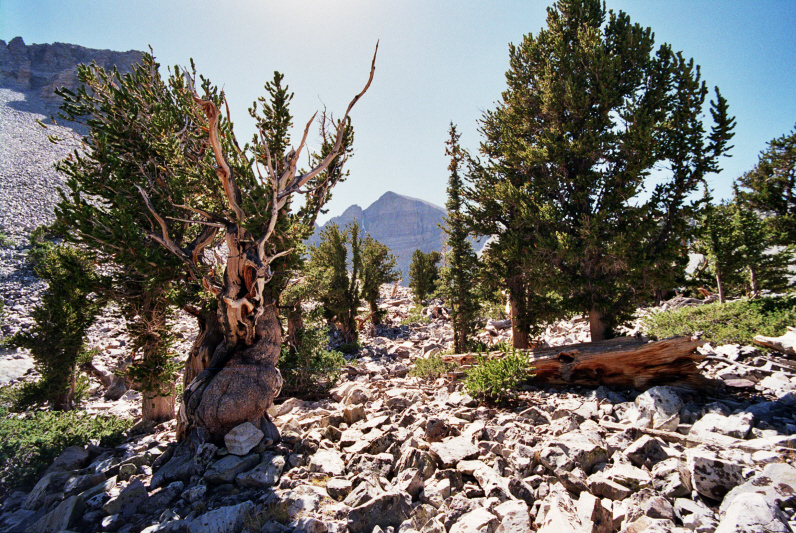 Water and nutrients also make a big difference so the choice of bristlecone pines was a great choice for a proxy of agricultural conditions, not global temperatures. A good example of how to use tree rings for proxies. Trees from a dry land area in Myanmar were used as a proxy for air moisture and it showed a good correlation with PDO. Mann, Briffa and co chose to delete the data that directly compared the tree ring data with actual temperature measurements. The proxies are almost always calibrated against the temperature (thermometer) record. If the thermometer record is not to be trusted, logically, nor can the proxy calibrated from it. That is part of the reasons for a lack of proxies in recent decades. Another part is that global temperatures have become relatively constant and it is hard to callibrate a variable against a constant. Totally agree, Greg. Australia’s official temperature record is at best a rough guess and at worst a shemozzle. Bob F-J, an excellent analysis. I noted exactly the same effect about the Angry Summer last year. Greg, inasmuch as our satellite records are only 33 years long, UAH also suggests that 2013 was the hottest year. So while I’m as dubious as you about inexplicable adjustments and mystery black box methods, it’s possible that 2013 was the hottest “since records began” (averaged over the continent and the year). As you can see from my intro, my view is that even so, it’s hardly a big deal in any scientific sense. Naturally a proper independent audit which has not been done, might show something different. I think it’s very important not to lose sight of the fact that the whole dataset is pathetically short, Australia is only 5% of the global land mass, and that one hot year is not a “climate trend”. The world started warming before we started measuring Australian temperatures and there is no causal link there with CO2 despite it being implied in supposedly scientific “expert” statements. Hottest in 33 years. Which is the satellite record. But as the author points out, 1896 (before satellites) does seem to be hotter. Since no one had a clipboard back then, it is relegated to “noise” and the meme lives on. Yes it’s quite a significant omittance, if I claimed we actually lost 1 hour of daylight during daylight savings time in Australia all I’d do is erase the 2pm – 3pm hour from a bar graph, the graph would show only 23 hours in a day but being a publicly funded authorized propaganda machine I wouldn’t care. Actually the graph would show 2-4pm which would add up to 24hrs but the daylight data would be missing which is ok as the rest of the country is too stupid to notice, win win for the YBOM. Besides which, we have no way to ascribe a useful meaning to average temperature that I can agree with. Temperature at some given point at some given time means something. An average of those recorded T & Ts means about as much as the average human. This has been one of my arguments since year dot. An average of “something” over a spherical globe for a 12 month period means what exactly? They pretend that if you keep doing this year after year that you can infer something from it. But I’m not at all convinced it is useful at all. An average height of all of humanity is about as useful in my opinion. Interesting, but so what? Of course, I might be accused of cherry-picking the start and end dates, but let’s see if some wizards of doom can clarify such. BTW, the separation between linear trends are not relevant, but the slopes verily are. Oh,and the UAH data does not go along with disappearing the Super El Nino! It is not record cold or hot years that are damaging so much as cold snaps and heat waves lasting several days at once, the latter with fire hazard in particular. You can have a record year or month or season simply by having each day 0.01 degrees colder or hotter than the previous record day-by-day. The numbers would show as a record, but it is doubtful if there would be any meaningful consequence. There is only so much that one can do with a historic Tmax and Tmin each day. The more significant metric is some form of energy flux integrated over each day. We cannot reconstuct that for old times. NOT in BOM’s highly cooled past. REAL data from around the 1900′s-1920′s shows temperature significantly above current temperatures. Also, around 1938-1940 shows real data above the current level. Remember, the guys that did all the adjustments at BOM came straight from Phil Jones’ CRU stable and are as complicit as CRU and GISS in the wholesale FABRICATION of the global warming trend. Even if it was the hottest year, What does anyone expect after half a century of the strongest series of solar maximums. since the MWP !! But that’s now over.. the sun is going into sleepy mode.. and the cooling has started. Here are a couple of examples of just how much COOLING has been applied by BOM. It really is a monumental FARCE. No wonder its so easy to get warm records ! No it is not true! I do not know where that came from and I don’t know how it can be true. The BOM records are have been adusted. The whole concept of a warmest year for Australia is nonsense, given our current measurements and knowledge. It is all conjecture. Jennifer Marohasy has a lot more on that subject. I would like to give acknowledgement for this quote. I think it was The Griss, who told us, but not sure. That was supposed to be a reply to #1. According to the UAH satellite statistics, the greatest monthly anomaly in Australia’s recent past was August 2008, in winter. The first couple of months in 2014 were abnormally cool, so for every action there appears to be an equal and opposite reaction. BOMs choice of dates and mix of temperature records, and their reporting (press releases thereof) would appear misleading and therefore a case of flannery. verb Br/Aus informal: bland, fluent talk used to avoid confuse or mislead when discussing a difficult subject. (flanner) Br/Aus informal: one who uses such fluent evasive talk to confuse/mislead others. How’s the US and A going? They having a Hot Angry Winter? Are they expecting the ice in the Great Lakes to clear in time to swim on July 4th weekend? There’s some rule in this game that says colder equals hotter. So before long those cold winters will be claimed as record high temperatures. Wait and watch. Weren’t some of those temperature low records by some 10-15C? I doubt even NOAA, Giss or HadCrut can manage that sort of adjustment..
… but they could prove me wrong. As Roy said. As for reality, still having freezes (we are usually done by early March in this area), but pleasant days as well (read: 60s, 70s F). However up north (Great Lakes), they are still freezing most of the time. I do not live in sunny California, but appreciate it even more I do not live in the frozen great lakes area either! I think the Vegas odds on the Great Lakes being ice free by July is running even money about now. The fetish with localized temperature readings is becoming moronic. Might as well stick thermometers down volcanoes and start saying we have record high temperatures all over the place. Yet the most reliable measurement of global temperature; that by satellite has confirmed global temperatures are not rising at any significant amount for the past 30+ years!! One wonders if we had such readings going back 100 years what we would find. I never trusted surface measured temperatures. They keep changing the way they adjust some of them and delete others. I suggest we scrap all surface readings for the purpose of climate change monitoring, and only use satellite readings from now on to see if global warming even exists before we all jump over the cliff following the screaming alarmist shouting out that the world is about to end. The alternative, which is impractical is to place a remotely sensed thermometer in every square km all over the world. My son is taller this year than he has ever been. Does it follow that 1) His growth is catastrophically out of control, and 2) All boys on the planet are experiencing dangeriously accelerated growth rates? You never know. So you better check to be sure. Has your observation been peer reviewed? Perhaps you should use the precautionary principle and do something drastic to stop him growing higher; LOL. Forgot to mention that he is short for his age;)! In other words we need to back date the carbon tax a few thousand years at least to make up for lost time. LOL. There is not enough data to make an assessment. You’ll have to keep us up to date with his progress,meanwhile we’ll decide on mitigating action, e.g. altering all growth records to reflect the modeled truth. Another one that falls under the heading of suspicions confirmed. But reality does not intrude on the world of the zealot. Does it? The BOM won’t allow access to records before 1910 because they were taken without using a Stephenson screen. For the capital cities at least this is a straight out lie. Perth had one in 1899 among several recently installed in that State. Other capitals had these screens in use in the 1880′s and earlier. As for Media manipulation, Adelaide has “the hottest summer EVER” **. It had 13 days over 40℃, one more than in 1896/7. Conclusive??? proof??? of global warming. AND note that they can use the old figures if they judge them suitable. ** never mind that up to mid December and since mid Feb. plant growers have been complaining about cool conditions. Yep! Sounds like business as usual. You do have to wonder why a supposedly government body obsesses about the “warmest” whatevers. Perhaps a political agenda? I did not even notice that. My spelling is worse than Joanne’s! Not to worry. You aren’t alone. Every one of those graphs show a long term trend of colder to hotter except perhaps one for the Northern Territory. I think you have proven the rising temperature case very well. Congrats Bil, you have finally realized that Australia has warmed since 1910. I’ve been saying that all along. Has it warmed since 1896? You and I both don’t know. Do any of these trends matter to the CO2 debate? A weak correlation over 5% of the surface? It does to Bil, but it would not to a scientist. NoJo, the manipulated BOM data shows a warming since 1910..
That is a totally different thing from there actually being any warming. Perhaps there should be a little disclaimer inserted at the bottom of each of BilB’s comments stating that his company, and therefore himself, profits from the production of solar system and thus has a vested interest in sewing confusion and promoting climate change alarmism. Good enough for the proponents of alarm to suggest such things for skeptics. I suppose, we don’t really want to drag ourselves down to that level do we? I know this is not the BoM graph but this NASA GISS (which tells us the world is warming) graph is a good example of how temps have been adjusted. The first one is for the max raw temps for Adelaide (which looks like West Terrace, Kent town and AP combined). The next one is the adjusted version (v4). BoM does the same thing, especially when they transferred the raw data to the now superseded HQ data which these time series are based on. Totally agree, griss. By the way, GISS NASA has archived all their v1 (raw) data and it is now difficult to access. I ate a bilby for Easter……. We barbequed a warmist over my fire pit in the backyard. Tasted like tofu so chucked it in the fire and gorged out on whale steaks from the latest hunting season sitting on polar bear skin rugs. Nothing like indulging in good old fashioned decadence! It is called the Climate of New South Wales and was written by the then Government Astronomer of New South Wales in 1877. It contains journal references/abstracts dating back to the First Fleet (1788). BilB (and other Climate Hypochondriacs), after you have thoroughly read through this ‘book’, came back to us and tell us that ‘todays’ climate is any worse than that of 1788-1877………and prove it wrong! BTW BilB, I will not be holding my breath for your reply. It is noteworthy that the mean temperature of Sydney is 62.6, and not 66.0 as given in some standard works of reference. If I use wunderground’s Almanac for Sydney (K-S airport) it will tell me since 1999 the avg Max is 21 and avg Min is 13, and split the difference to get the average which is 17°C. Granted, the airport is a different location to Observatory Hill, but the further distance from the city should reduce the UHI effect by some unknown amount. Anyhow, Russell’s estimate in 1872 was 62.6°F, which is 17°C precisely. They’re the same. Probably just an unrelated random co-incidence. WUndergound does not allow custom downloads from “Sydney Regional Office” station any more, but after some tedious clicking and copypasta, the 2-year average there today seems to be 18.4 degrees. According to GISS (via Warwick Hughes) the UHI for Sydney is about +1.2. Which means Observatory Hill today would be averaging 17.2 degrees without the city. About 0.2 degrees warming in 140 years. Gosh, sounds catastrophic. But the above data has not been officially adjusted, homogenised, and corrected, so you probably should throw your whole web browser down the nearest Memory Hole at this point. The chances of exceeding the median rainfall during the January to March period are 30 to 40% over most of Queensland, parts of the eastern NT, most of NSW and northeast Victoria. In other words, the chances of below average rainfall are 60 to 70% over these areas. Surprise Surprise! It will be hotter & drier, because of Global Warming! Does the BoM ever wonder why? Gavin Schmidt, a climate modeller at NASA’s Goddard Institute for Space Studies, in New York, tells The Australian that a lack of good observational data available when the experiments were conducted led to input values for aerosol concentrations that were probably too low. And the current solar cycle has been less active than the last one, so the models overestimated the amount of incoming solar radiation. “There is a case to be made that the modellers were unlucky in a bunch of different things, which has meant that in the very short-term trend in the last 10 years or so they (the models) are running slightly warm,” he says. NO. They said that solar energy had LITTLE TO NO EFFECT on the warming of the latter part of last century….. They DO NOT get to use the now quiet sun as a get-out-of-jail card ! Some might recall that I have several times mentioned that the marked changes in UV radiation during strong solar periods (as in the last half of last century) allows for an increase in penetration into sea water. I have posted this link several time. While I have not had the information to go further with this, a paper has now appeared at the Hockey Stick that shows that changes in UV have a significant effect and a very good correlation with global temperatures. Solar variability, particularly solar maximums appears to have a MUCH greater effect on global temperatures than the so-called ” climate scientists” are willing to admit. Not sure what the “records” say, but I thought last year was quite nice – after living through 60 of these “cycles”, I am pretty sure I have experienced hotter years in the past. Most of the “heat” for the so-called “hottest heffer” year was out in the centre of Australia. The coastal cities were all pretty much as usual, with a couple of very hot days when the heat escaped from central Australia. A normal summer in other words. But as I said above, when they apply significant temperature reductions to the past , its easy to say its getting warmer. Like Giss and HadCrut, the warming in Australia comes almost totally from the cooling adjustments to the past temperature record. And since many places have raw data that actually trends DOWNWARDS, it appears the adjustments may actually be MORE THAN the actual warming. Just look at what derision the hockey stick attracts? Even although it has been confirmed to be a true and accurate representation by several different scientific investigations and methods, such as ice cores, sediments, etc, etc. I thought “the Team” taught you guys and gals to not engage in science, you always lose.. Stick to ad hominems/straw men/smears and sneers..lets face it..you aint got much else. The “confirmation” used the same lousy proxies..with the same problems inherent in the proxy selection..with the same data torture methods. If you cared about science, you would know this or at the least, be interested. But your side is always too busy with “getting the message out” and not the actual research. Idiocy and Noble Cause Cause Corruption explains alot. October and November were unusually cool for my area near the SA border. I find it very strange that the spring for SA came out above average. We had very late frosts that damaged the neighbours crop. Many other wine areas had record minimum temperatures for October that caused a lot of damage. As I have mentioned before, Renmark had broken is record twice in one week for lowest recorded temperature in October but it didn’t even register in the local news despite the effect on crops. CTV’s headline – “AUTHOR” argues? Tom Rand is a successful cleantech venture capitalist, inventor of the Green Bond, cofounder of North America’s greenest Hostel, Planet Traveler, and the author of 10 Clean Technologies to save our World. Tom is also Lead Cleantech Advisor at the MaRS Discovery District, Canada’s largest innovation center in Toronto that helps entrepreneurs by providing advice and acting as a catalyst to generate economic activity from promising intellectual property. It’s hard to keep pace with Tom Rand. When he speaks it’s like a tsunami of ideas surging forward, leveling pessimism and apathy in its wake. Rand is a big thinker and he is happy to share his views with anybody who wants to make a real difference in the low- carbon economy. “It is not rocket science,” Rand commented, “the technologies have been proven and their economic benefits are clear. All we need are courageous leaders and imaginative Chief Financial Officers to drive this change.” All we need, it would appear, are more Tom Rands. “financial strain of a carbon tax would be TEMPORARY as society shifts to a more sustainable energy model based on solar, wind, geothermal and next-generation nuclear technologies”. So switching permanently to more expensive electricity will have no great effect? It would seem impossible unless those next-generation nuclear technologies deliver, because that is the only way possible. In any case how will penalising 25-40% of the economy of a nation deliver 100% benefits? Sounds to me like he could sell snake oil. not at all surprising. MSM is self-destructing. The IPCC provides no proof whatsoever that it is composed of the world’s top scientists. In fact, it declines to make public the CVs of its personnel. Other IPCC lead authors are poorly qualified individuals from obscure nations, who were selected to give the report an international flavour. 60% of the people who helped produce this latest report have never worked with the IPCC before (see the bottom of p. 3 of this PDF). Was there really a 60% turnover rate in the world’s top scientists since the last IPCC report appeared in 2007? IPCC personnel have so little power, they aren’t able to alter their chapter title by a single word. In reality, these people are mere cogs in a large, bureaucratic, UN machine. Times readers deserve better than this. The ABC’s Alberici jumps in at full flight, only too willing to display her bias and pig ignorance for all to see. And this delusional nonsense is paid for by the poor bloody taxpayer with zip chance of balancing this rubbish via a more informed ABC journo. Can anything be more corrupt than this misleading garbage? Yes it really is a religion. And I thought Germans didn’t have a sense of humour. But then again they’d either laugh or cry at their pollies insanity. Neville: Here’s another one – a German rapper doing the same thing. When the video starts, allow the bottom that displays the seconds to disappear so that you can see the English print. Drax’s White Rose project is being developed with BOC Group and Alstom SA in a consortium called Capture Power Ltd and seeks to build a new 426 megawatt coal-fired plant fitted with CCS tehcnology in Yorkshire in Britain. Davies was one of the architects of the scheme launched in 2009, when the EU promised to finance up to half the cost of at least eight demonstration CCS plants across Europe through the sale of 300 million carbon permits. Full-scale CCS plants at power stations are expected to cost upwards of 1 billion euros to build. So far the EU scheme has only been able to fund renewable energy projects as all the CCS candidate plants either pulled out or were deemed ineligible after member states were unable to promise financial backing. The Drax project is the only CCS scheme left in the competition and could receive a maximum of 15 percent of all funds raised, amounting to around 300 million euros. “That would be a very helpful contribution … but it is an order of magnitude lower than the UK will need to put in,” said Chris Littlecott of environmental group E3G. As the bloc relies on coal for some 25 percent of its electricity, the Commission has previously said without CCS it risks missing that goal. Revenues for China’s biggest sellers of U.N.-issued carbon credits shrunk last year to a tenth of 2012 values, choking off billions of dollars flowing to clean energy projects in the world’s top carbon-emitter. The carbon offsets generated in China had offered lucrative low-cost compliance options for emitters when European Union allowances traded at above $25. But after the financial crisis a slowdown in EU industry caused emission levels to drop, creating a huge oversupply of tradable carbon permits. But demand would depend on the government’s willingness to impose strict emission caps on its biggest polluters, and whether other buyers emerge needing carbon offsets. “The prospects of the Chinese domestic market depend on pricing and demand in new markets, including other Asian countries such as South Korea, Japan and Taiwan,” said Jeff Huang, China director of the Intercontinental Exchange. Burning coal for power generation produces more than a third of the world’s man-made carbon pollution. But technology for cleaning up coal is hugely expensive and critics say it is unproven at a commercial scale. Despite this, Carbon Capture and Storage, or CCS, remains one of the big hopes for slashing global carbon emissions by 2050, and avoiding dangerous climate change. GUEST: Dr Andrew Minchiner, General Manager, International Energy Agency’s Clean Coal Centre. ***Gregg Borschmann is such a player in the ABC CAGW madness. Any unburnt particulate carbon is well filtered out, as are most other compounds except H2O and CO2, neither of which is a pollutant. So far the auctions have generated $1.5 billion, but cash will start to pour in next year when the cap is applied to fuel suppliers, which account for nearly 40% of the state’s greenhouse gas emissions. Revenues will balloon as the California Air Resources Board reduces both the cap and the free allowances. The state legislative analyst predicts that cap and trade will raise between $12 billion and $45 billion in toto by 2020. One thing is certain. They will not raise near as much money as projected. No tax ever does. Draft climate change legislation to be published today contains several key changes that will tighten the State’s obligations to reduce greenhouse gas emissions. The legislation makes an important distinction for agriculture, eschewing following emissions targets in favour of an approach to carbon neutrality. This will be dependent on the acceptance by the EU of carbon sinks (forestry and bogland). The full Bill is expected to be published before the summer. Opening price levels in the carbon markets have been directed by local governments. Traders have seen significant upside potential in markets where starting prices were set low. But trading has been less enthusiastic in regions such as the southern province of Guangdong and the capital, Beijing, where prices started at 60 yuan and 50 yuan respectively. ***In Hubei, the government set a minimum price of 20 yuan for emission permits, the lowest in China and a mere third of levels in Guangdong. Maurice Newman, the chairman of the Prime Minister’s Business Advisory Council (& former Chairman of both the Stock Exchange and the ABC) discusses climate change and says that there is little correlation between carbon dioxide and the warming of the planet. EMMA ALBERICI: It’s no secret that you don’t agree that man-made CO2 is causing global warming. Given there is now consensus among 97 per cent or so of climate scientists across the world that the view – around the view that human activity is responsible for climate change, what would it take to convince you? MAURICE NEWMAN: They all come up with flawed methodologies. So we don’t pay any attention to that. We know that there are a whole host of scientists out there who have a different point of view, who are highly respected, reputable scientists. So the 97 per cent doesn’t mean anything in any event because science is not a consensus issue. Science is whatever the science is and the fact remains there is no empirical evidence to show that man-made CO2, man-made emissions are adding to the temperature on earth. We haven’t had any measurable increase in temperature on earth for the last 17.5 years. If you look back over history, there’s no evidence that CO2 has driven the climate either. So I know that this is a view which is peddled consistently, but I think that the edifice which is the climate change establishment is now starting to look rather shaky because mother nature is not complying. EMMA ALBERICI: I just want to take you up on that because it would appear that there is strong consensus, at least among – certainly when it comes to the IPCC, that is a group that has brought together under the auspices of the United Nations, the science around the world, it doesn’t actually do science itself, it just collates all the science and puts it forward. Now 195 countries contribute to that. Nineteen academies of science across the world, including I have to say the Australian Bureau of Meteorology, the CSIRO, NASA, the American Academy of Sciences, the British equivalent, the Canadian equivalent, some really reputable bodies around the world are now agreeing that it’s human activity that’s causing climate change. So I’m wondering, who is it that’s influencing you so that is so convincing you otherwise? MAURICE NEWMAN: I just look at the evidence. There is no evidence. If people can show there is a correlation between increasing CO2 and global temperature, well then of course that’s something which we would pay attention to. But when you look at the last 17.5 years where we’ve had a multitude of climate models, and this was the basis on which this whole so-called science rests, it’s on models, computer models. And those models have been shown to be 98 per cent inaccurate. MAURICE NEWMAN: By Roy Spencer, who’s carried out a thorough review of all of the models and the empirical data which against both land-based and satellite-based measuring. And they were found to be wrong. EMMA ALBERICI: He’s one scientist, climate scientist. MAURICE NEWMAN: It’s not a question of being a scientist. EMMA ALBERICI: But he is a climate scientist. MAURICE NEWMAN: Yes he is a climate scientist. EMMA ALBERICI: He is. He was at NASA. His colleagues at NASA disagree with him. MAURICE NEWMAN: There’s a study that came out from NASA in the last few weeks which says that the impact of CO2 on the upper atmosphere brings about a cloud and the result of that is a bit like our own body temperature moderating as a consequence of perspiring. So you get an albino effect which reflects sunlight. If you want a correlation between global climate, don’t look to CO2, look to the sun’s activity, there will you find a very close correlation. EMMA ALBERICI: I think the one thing we can agree on is that neither of us are scientists. EMMA ALBERICI: But I’m just going on people with great reputations around the world, including our own Chief Scientist, Greg Hunt, the Environment Minister, Tony Abbott, the Prime Minister. I mean, around the world, there seems to be consensus that it is a man-made phenomena. What do we make about the pause? EMMA ALBERICI: That it’s a pause. I guess that’s what scientists say. It’s a pause. They look back 800,000 years as I understand it, so 17 years in the scheme of things isn’t an enormous amount of time. KERRY BREWSTER: I agree, but then you’ve got scientists, climate scientists now in Norway, in Germany, in Russia, in America, saying we’re now going in for a period of 30 or 40 years of increasingly cool climate conditions. EMMA ALBERICI: I’ll only ask you one more questions on this because I do want to talk about other things, but both Marius Kloppers and his successor at BHP Billiton Andrew McKenzie agree that climate change is human induced. So what if those 97 per cent of climate scientists and all business people across the world, like the likes of Bill Gates and Richard Branson and the miners here in Australia, what if they’re right and you and the scientists you quote are not right. Doesn’t it make sense to have a policy that at least transitions Australia to cleaner fuel sources? MAURICE NEWMAN: Emma, let’s not confuse the issues. Cleaning the atmosphere, which is what carbon pollution is about, not CO2, CO2 is not a pollutant. But cleaning the atmosphere, being more efficient, all of that makes sense. That’s got nothing to do with climate. That’s to do with economics and being efficient. But I would say to all of those people who are arguing that CO2 creates global warming and man is adding to the global warming to show the empirical evidence of where this is so. Because I’m saying to you that where this originates is from models. Computer models which are wrong. Now, if you can show me where there is some sort of correlation that proves beyond doubt that what we have is global warming as a consequence of CO2 and man’s contribution to CO2 in the atmosphere, well then we can have a different conversation. EMMA ALBERICI: I’m sure there will be scientists lining up to give you that information but we’ll move on. I agree it needs it’s own post as there is so much sense spoken in this some would find it hard to take in one gulp. Alberici, so typical, mindless questions, all the logical fallacies, just trying to save the world. Jo, your discussion of the 2013 temperatures reminds me of something Mark Twain once said about a man who had one foot in a bucket of boiling water and the other foot in a bucket of ice water and said on the average he was comfortable. Basically everyone in Australia was standing with both feet in a nice warm sand or water. ie a normal Australian summer. Only the lizards and camels out in the central parts got any real extra warmth. It took 116 years to dispatch the theory of phlogiston (1667-1783). It may take longer to remove this UN inspired nonsense, and cost everyone many $trillions, as well as costing many innocent lives. Speaking of obsessions, how about a scientific obsession with “hot” records, such as records of the Hockeystick team’s emails? Perhaps it’s old news for some, but this wasn’t covered here last week when it first broke, but was mentioned on WUWT, and it sounds like a bit of bad news unfortunately. Justice Donald Lemons wrote in the court’s decision that handing over the e-mails would have put the school at a “competitive disadvantage,” thereby allowing it an exemption from FOIA. Viewing the facts in the light most favorable to the university that prevailed below, it produced sufficient evidence to meet each of the higher education research exemption’s seven requirements. (7) such data, records, or information have not been publicly released, published, copyrighted or patented. …it sounds like the original intent of “proprietary” was information and discoveries with military or commercial applications in which an IP right has been gained by the government/private sponsor by contract with the educational institution, since that information is the type that would need to be kept secret until their patent application could be granted (or longer in the case of a secret classified patent). Hopefully there is some “original intent” argument that can be made in appeal. But no more hockeystick smashing for the time being. If the original supporting data, and all other evidence, is not allowed to be seen then it is not science, and everyone, no matter how qualified can sneer and vilify the paper as the product of a fevered mind. It will have as much merit as the advocates of eternal luminiferous aether or phlogistan. I recommend this action to start immediately. Not that I am interested in reading anyones emails, but if I were I would be really interested in reading Roy Spencers’ correspondences. This is where the real conspiracy will be found I believe. The UAH Satellite temperature for the World recorded the same average for 1983 and 2013.The fact that Australia recorded higher is not relevant. With CO2 increasing 25%in the same period it proves it is not warming the World climate. So finally the science is settled. Peter: Whilst agreeing wholly with your sentiments, have you made an error in your calculation? According to my figures, CO2 in 1983 was 343.03ppm, and in 2013 396.48ppm. That’s an increase of 53.45ppm, which I calculate to be 15.58% – call it 16%. Have you perhaps got the total increase in CO2 since readings at Mauna Loa began in mind? 315 in 1959, and 396 in 2013 if I recall correctly – that’s 25.7%? The July and December averages shown on these maps published in 1890 (6 down, 4 in – click on to enlarge then zoom) are at least as warm as those on the equivalent average maps on the BOM website. The capital cities are at least as warm as the 1961 – 1990 averages and most if not all of the interior is shown as mostly warmer. Now I realise their instruments weren’t as accurate and there weren’t as many stations back then but the statistics gathered on other matters are extremely concise so there is no reason to assume the temperature data is not similarly as meticulously recorded. Record temperatures? Of course it’s all PR. According to the UK’s Central England Temperature record (CET), the year 1686 had the highest average temperature (10.13C) since records began (in 1659). Then in 1733 we see another record: 10.47C, equalled in 1834 and 1921. Then in 1959 we see a new record set: 10.48C! After that, we see 10.63C in 1990 and 1999 and 10.82C in 2006 – and can we realistically attach any credibility or importance to figures in hundredths of a degree anyway? What these ‘records’ don’t tell us is that there have been warm and cold periods during all this time, which are well documented and described. The ‘records’ are trivial average temperature changes from year to year of which far too much has been made by the publicity seekers and scaremongers. There are five years in the CET with an average temperature of 8.83C: 1956, 2010, 1902, 1754, and 1659. The yearly average tells us nothing about what actually happened during that year – was it a cold winter? hot summer? – and so forth. There’ll always be a ‘record’ somewhere waiting for the propagandists to milk for all it’s worth. Please be careful with the CET as early figures may not have been that accurate, although 1686 was probably OK as Hooke had checked and calibrated the thermometers a few years previously. The early 1700′s through to about 1778 are not that accurate through changes in what was measured and how. As for your query about averaging figures read to 0.5℃ (at best) being averaged to 50 times that accuracy..well, I am sure you know the answer. Graeme No.3: I agree regarding your comments re the accuracy of temperature figures. I haven’t kept the email (perhaps I should have), but a few years ago I wrote to the Met Office about this very subject and was told that their thermometers were considered reliable to 0.5 degrees C.
Readings of smaller fractions were estimated visually to the nearest tenth before the advent of electronic thermometers – which I have to say surprised me at the time. My overall view on this is that since the Met Office consider such readings to be accurate enough for their records, then they’re good enough to draw certain conclusions from – and as you see from my comments I like to see other accounts of what was happening at any given time. Even with reservations about aspects of its fidelity, I think it’s good that this record is available. I’ve found it a very valuable tool in my arguments with the warming brigade, because it certainly shows that any warming which there has been is trivial. It’s also interesting to note that at no time has the temperature reached 11 degrees C, even in recent times. As a resident of Newcastle, NSW, working permanent nights, I often use a small A/C unit so I can sleep on hot summer days. In many past summers it has run on most days, during this “2014 summer, another angry summer” it was rarely needed. I say B.S. to their claim. Jo and/or mods. Can you have a look at my comment made @ 6:33pm (#11.4). It has been in moderation for over an hour. What really amuses me about all this wailing and gnashing of teeth by the warmists about Australia’s temperatures is they are ignoring the fact that Australia’s population (less than the state of Texas) is a tiny portion of the world’s population, about 0.3%. So, even if the doomsday scenarios prophesied by the warmists are true (and please don’t think I believe them), Australia could do nothing about her CO2 emissions and still have virtually no effect on the climate. Countries like China, India, USA, Brazil, etc will have to bear most of the burden. If it is determined that India and China both need to reduce their CO2 emissions by 50%, then if each country reduced their emissions by 50.5%, that would likely take care of Australia’s contribution. You may, Jo, because this record stuff comes from the world of sports and entertainment. You will never see a good statistical analysis of these records because they are by definition severely dependent upon each other: something is a record only if it beats another record. It’s garbage to be used for fun or propaganda.